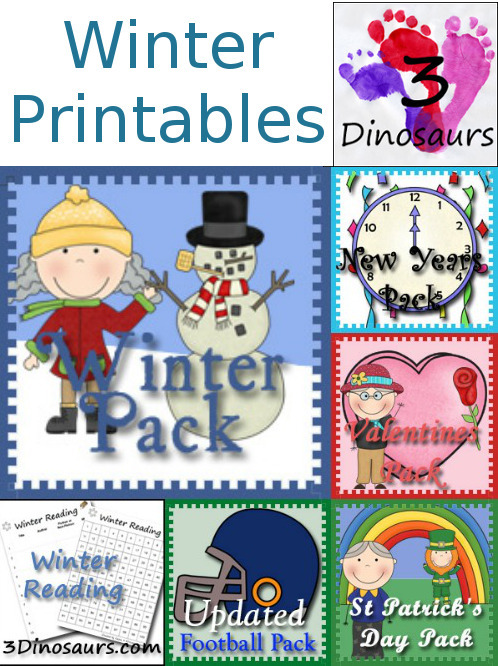 With winter coming up quick I thought I would do another round up of printables for the season of Winter on 3 Dinosaurs! I know a lot of different people study different things during the season but I thought I would highlight just a few of the basic packs for the seasons on the site. At the end of the post, you can see other roundups that I have done. As things are added this will get updated. Christmas is not in this list but you can find all the the Christmas Printables here. I’m going to sort each of these out by themes. Some of them will have more per theme than others. This will also be updated as the season goes by and more is added to it. The New Years Pack is a Tot-Kindergarten themed learning pack. It has over 50 pages plus the Tot Pack. It has 3 part cards, matching cards, writing, dot marker pages and more. New Years Pack Update is full of kindergarten through second grade activities for kids. There is math, writing, letters and more. It has over 45 pages! Yes I’m putting Football Pack in the winter as well, because of the Superbowl! They are fun to use at any time during the football season. Football Pack Extra has an added set to the pack! The Snow Learning Pack is the second winter theme pack. While is is still good for kids 2 to 9. It has a lot more language and math activities in it for older kids. I love this set! This set goes well with these two books: Snow (Sunburst Books) and Snow (I Can Read It All By Myself) . The Winter Olympic Pack is great for learning about winter sports. You will find a part one and fun additional set that is part two. You can also use the Country Learing Printable with the Winter Olympics set. Penguin Learning Pack is also a great winter activity for kids. You can also check out the 7 days of winter printables that Royal Baloo and I put together. Groundhog Day Pack is perfect for the holiday. Simple and fun activities for kids. Valentines Pack that goes with the book There Was an Old Lady Who Swallowed a Rose! . THere are over 120 pages. The Free St. Patricks Day Pack goes with the book There Was an Old Lady Who Swallowed a Clover! by Lucille Colandro . This pack has a printables for ages 2 to 8. This is great for younger kids. St Patrick’s Day learning Pack has 50 pages and is made for kids 5 to 10. This has 1st to 3rd grade great math and language activities. Romping & Roaring R Pack is a pack about R is for Rainbow. This is great for letter R or just doing a rainbow theme. St Patrick’s Day Mini Unit on Free Homeschool Deals. The Penguin Learning Pack is great for a winter time learning theme. New Years Easy Reader Books has two different books with an option to buy a set with more books and activities with the books. The New Years Sequencing Cards Set is a fun way to work through the events that lead up to the New Year! New Years Coloring with Word Print & Cursive is a fun way to work on new years words with tracing and writing the letter or words. Goal Writing Printables for the Year is an easy way to work on New years Goals for kids or adults with 4 options. My Goals printables is a writing activity to break down the goals you are working on. Football ABC Find is a great way to work on ABCs. Hands-On Learning: Football Themed ABC Puzzles are fun to match uppercase and lowercase letters. Silly Football Theme -ALL Easy Reader Book is a great way to work on the “-all” ending with a fun book. Snowflake ABC Find is a great way to work on you Uppercase or Lowercase ABC letters! There are 52 pages total. The Fun Easy Reader Books With Winter Themes. There are several book options and loads of fun for kids to read. Winter Olympics Easy Reader Book has some great witner sports for kids to learn about. Fun Winter Themed ABC Tracing for Print & Cursive for working on tracing the letters. Snowflake Sight Word Find has all 220 Dolch Sight Words for kids to work on. There are 225 pages in the set. Making A Snowman & Winter Sequencing Cards Sets are great sequecing activities for winter. There are several sets plus a bundle off all of them together. Fun No-Prep Winter Learning with Blends are great for kids working on sc-, sk-, sn- and st- blends. Winter Coloring with Print & Cursive Words are great for many ages that are working on print and cursive together. Snowman CVC & CVCC Word Family Writing is a great way to work on rhyming words and writing sentences. Check out my Winter ABC Pack on FreeHomeschoolDeals.com. Fun Snowflake ABC Tracing Strips on FreeHomeschoolDeals.com. There is a expanding winter reading chart. It has some reading responses as well as the sticker charts. There is also a second set of Weekly Winter Reading Charts. Winter Themed Bookmarks are 12 fun bookmarks for kids to use. Blank Winter Reading Charts are fun for kids to fill out. Winter Themed Writing Paper is fun with girl, boy, snowman, tree and snowflakes. Fun Kids Winter Activities Writing Paper has kids doing winter activities. Groundhog Day Sequencing Set has two fun sets for seeing and not seeing his shadow. Two Fun Valentines Sequencing Sets that has making a Valentines and mailing a Valentine. Easy to Use Valentines Themed Reading Charts are fun themed reading charts to help kinds read minute, books, chapters and more! ABC Themed Valentines Easy Reader Book is a great book with beginning sounds. Valentiens Writing Paper is great for writing valentines themes. Romping & Roaring H Pack is great to use during this time. Valentines Themed Bookmarks can be used when kids need them. Plus make great valentines to give. Valentines Sight Word Finds are a fun way to work on learning the sight words. Valentines ABC Find is a abc search for the letters with tracing. Fun Valentines Themed Sight Word Puzzles Sensory Bag are fun sight word puzzles in a sensory bag. These puzzles can be used with or without a bag. St Patrick’s Day ABC Letter Find are fun ways to work on your uppercase and lowercase letters. Fun St Patrick’s Day ABC Easy Reader Book is a simple easy reader book for kids to work on their ABCs. Free St. Patrick’s Day Writing paper is great for your seasonal writing. There are two different types of lines for kids to use. Here are some fun St. Patrick’s Day Bookmarks for kids to have. Clover ABC Pack at FreeHomeschoolDeals.com. Fun St Patrick’s Day ABC Tracing Strips at FreeHomeschoolDeals.com. The No-Prep New Year’s Number Color & Trace is a number writing set that goes from 0 to 20 and has two options for the pages. The New Years Clock Task Cards is a fun set of cards and worksheets to work on time with two different levels of learning. Football Number Color and Trace is an easy way to work on numbers 0 to 20. Football Themed Number Counting Mats are perfect for workong on numbers 1 to 20 with 4 different mats. Football Shape Matching Puzzles are fun 2 piece puzzles for kids to match. Football Ten Frame Addition Cards & Worksheet are a fun hands-on way to work on addition. Hands-On Learning: Football Sorting Multiplies of 3 & 7 are fun sorting and recording for multiplication with 3 and 7. No-Prep Winter Themed Number Color & Trace are fun to use number pages for winter. You have nubmers 0 to 20 in them with two page options. No-Prep Winter Printables: Multiplication & Division and Addition & Subtraction 30 printables for each set with review sheets at the end. Winter Number 0 to 10 Themed Set is a mix of hands-on and no-prep activities for kids to learn their numbers. Snowflake and Snowman Themed Ten Frame Sets has two sets of ten frame activites that work on numbers 1 to 20. Snow Learing Pack Math Update also is a great addition to multiplication math activities for kids! Fun Math: Roll a Winter Scene is tons of counting, addition and multiplication fun for kids that is very hands-on. Easy Winter Multiplication Matching Cards are fun for working on addition grouping and arrays for multiplication. No-Prep Winter Math: Counting, Addition, & Multiplication is a fun spinning math activity for kids. Easy to Use Multiplication Spin & Color Printable has multiplication for numbers 1 to 12. Easy to Use Winter Subtraction Clip Cards is great for kids learning their subtraction. Easy to Use Hands-On Winter Counting Mats are great for working on numbers 1 to 10. Hands-On Winter Skip Counting by 2 Puzzles work on learning skip counting from 2 to 100. No-Prep Valentines Number Color and Trace: Hearts & Roses are coloring pages that work on numbers 0 to 20. Matching Heart Fractions That Are Equivalent is a hands on way to work on fractions that are the same. Hands-On Valentines Themed Addition & Subtraction Mats are an easy way to work on your addition and subtraction with ten frames. Hands-On Valentines Counting Mats: 1 to 10 are easy to use ten frame counting with a playdough mat. Valentines Number Color & Trace I made these for FreeHomeschoolDeals.com. Heart Counting Book was made for FreeHomeschoolDeals.com. Leprechaun Themed Number Color and Trace is a great way to count the coins the leprechaun has. St Patrick’s Day Ten Frame Cards are a great way to work on numbers 1 to 10 or grab the full set that works on numbers 1 to 20. St Patrick’s Day Coin Counting Printable is a fun math activity for kids to do. Hands-On St Patrick’s Day Counting Mats: 1 to 10 are great playdough mats that have counting with ten frames. They are loads of fun to use. St Patrick’s Day Skip Counting Puzzles are a great way to work on skip counting by 5’s. Horseshoe Number Counting Book For Kids is an easy reader book that works on numbers 0 to 10. There is a fun Winter Calendar with both snowflake and snowman themes. Here are some organizing printables with a winter and snow theme. Winter To Do Lists Printables and Winter Weekly Menus. School Lunch Menu planning is great for helping kids plan what their lunches are for the week. There is also a Winter Themed Shopping List you can print to keep track of your shopping. Winter Themed Monthly Cleaning List is a fun way to keep track of what you clean. Snowy Winter Gross Motor Dice for Indoor Fun is a great way to get kids moving while they are inside. Fun Valentines Themed Placemats is a great way to have fun on Valentines Day. Valentines Cards Printables have lines for those that are still working on writing. Valentines Calendar Printable hads some calendar cards and matching dot marker page. Valentines Themed To do List are a great organizing printable to use for the month. 7 Days of Loving Valentines Printables is a series I did with Royal Baloo. The St Patrick’s Day Calendar Printable is great for learning numbers and there is type types. 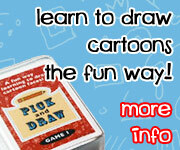 Pick and Draw Leprechaun – fun twist on a fun game. St Patrick’s Day Dot Markers Printables are fun for kids to do some hands on activities. This entry was posted in printable pack and tagged round up, st patricks day, valentines, winter. Bookmark the permalink. Pingback: 10 Free Winter Printables for Preschool to Third Grade - Fun-A-Day! You are just the best. I am so very grateful for your resources. They are smart, adorable, well-planned, and amazingly, free. Thank you for so generously sharing your ideas with us. Most often what helps best is using a different browser. Please read over the Printables Help and Errors. It has suggestions for when you are having problems. Not all cell phone and tables work well with the download for the site. I recommend on a cell phone to save the pdfs to your phone and not open them on your phone. Yes you can use them in a classroom.